I walk in. Another head nod from Omar. He turns to make the coffee. There’s a Black man to my right, sitting at the counter, eating breakfast. I never see Black guys in Omar’s. 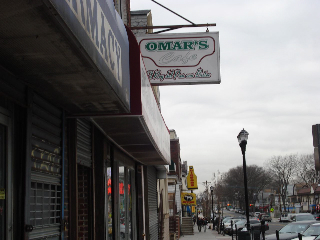 For that matter, I never see Americans in Omar’s. “What’s up Ma?” he says, his mouth full of food. “I’m good,” I say, digging out a dollar for my coffee. “Not today,” I say. We both laugh. Dude turns back to his food and looks up at the television. I pay for my coffee. Omar says nothing. “Have a good day,” I say to dude at the counter. This entry was posted on April 1, 2009 at 9:12 am and is filed under Blogorama, Uncategorized. You can follow any responses to this entry through the RSS 2.0 feed. You can leave a response, or trackback from your own site. i brag to everyone when a girl tries to kick it to me. and if it’s been a while since i’ve been kicked at, i’ll tell a story about previous times when girls have kicked it to me. Omar looks like a cool dude! !